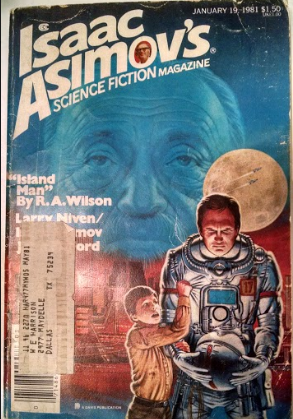 Martin Wagner, the Austrian RAW fan who has been digging up RAW rarities in much the same fashion as the RAW fans mentioned in yesterday's post, wrote to me recently to tell me that the Jan. 19, 1981, issue of Asimov's SF Magazine had a rare work of short fiction by Robert Anton Wilson, "Island Man," attributed to one R.A. Wilson. Martin wrote, "Island Man is a very unusual piece of work from RAW. I really would doubt that it's his if it wouldn't be listed at The Internet Speculative Fiction Database and other sources. I guess that's why he has published it as R. A. Wilson." Excited by the idea that RAW had published a story in a SF magazine that made the cover, with cover art by well-known SF artist David Mattingly, I immediately bought my own copy off Amazon, and it arrived in the mail Monday. I took the above photo from my kitchen table. But I was disappointed when I opened the package and looked the yellowing pages, once the property of Mr. W.E. Harrison of Dallas, Texas. My own opinion is that Martin was correct to doubt that it's RAW. It doesn't read like RAW's writing, and the biographical note attached to the story in the magazine attributes it to a writer living in a place where RAW never lived: "The author tells us he's a college graduate of scanty means whose time is mostly absorbed by writing. He has neither potted plants nor pets, although there is a cat who visits occasionally, and lives in a small Indiana town. This story is his first sale." The issue dates from the earlier days of the magazine, when George Scithers was the editor. Scithers died in 2010. My own theory is that the story was written by a guy from Indiana who never developed much of a career, and that Scithers carelessly published a byline that too closely resembled one of a better-known writer. "The ISFDB is an online open-content collaborative bibliographic database, that is, a voluntary association of individuals and groups who are developing a common resource of human knowledge. The structure of the project allows anyone with an account, an Internet connection, and World Wide Web browser to alter its content. Please be advised that nothing found here has necessarily been reviewed by professionals with the expertise required to provide you with complete, accurate, or reliable information."